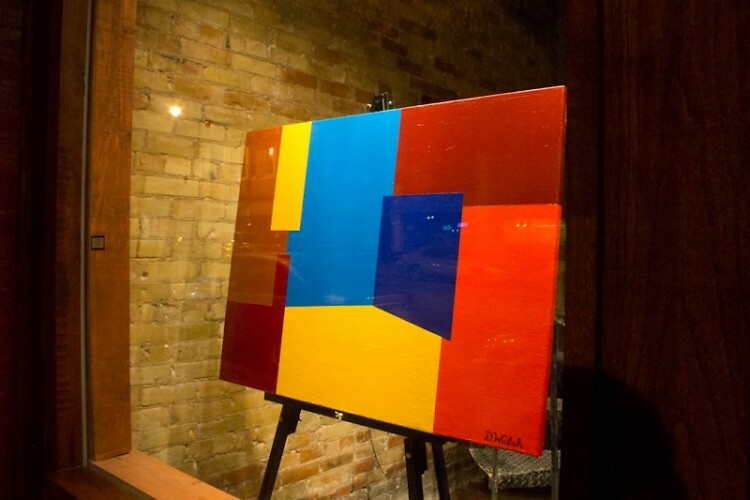 The author, an artist, talks about living on the Avenue for the Arts, her city-inspired abstract paintings and a bit of history about the building where her artwork is on exhibit during Free Radical 2012. South Division, Fulton St. to Wealthy St.
The10th anniversary of Free Radical is pursuing an event focused on commentary, dialogue and critique. Friday, November 2nd will present each gallery from a new perspective in the form of artist talks, photographs, video and much more. See the list of Participating Locations/Schedule of Events for more information. 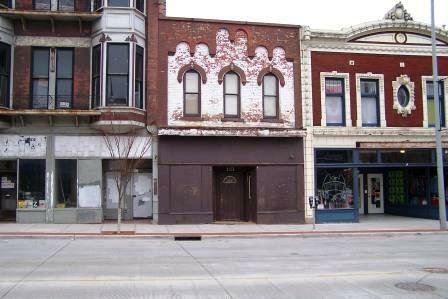 121 S. Division Ave: 2006 /Photo Courtesy of Performance Directions Inc. When I moved into a live/work space in Martineau Apartments last year, artists had already been on Division Avenue for years, acting as agents of change alongside tenacious business and building owners. I was very excited to join the ranks of this creative, welcoming community. Nine years after Free Radical came into being, I opened my second-floor studio area for Free Radical 2011, showing charcoal drawings I'd created at Dr. Sketchy's Anti-Art School and during life drawing sessions hosted in my space. At the beginning of 2012, in the wintery drear of January, I began working with color again and painting, after a long period of making primarily figurative charcoal drawings. I suppose you could say I was seeking to alter the palette of my visual landscape. I also made the decision to designate my live/work space as more of a private studio. However strong this craving for privacy and solitude while working, when a piece is complete, there's an undeniable itch to show it. I'd been working on a series of small, brightly colored grid-based works which incorporate the names of places on the Avenue, and also some larger, very blocky abstract cityscapes in warm colors. For Free Radical this year, I was presented with the perfect opportunity to exhibit in the windows of the refurbished storefront at 121 S. Division, across the street from my studio. I have to say it's a rather odd, but pleasant, experience to look out one's window and see your artwork in the building across the way. The present owner, Performance Directions Inc., was exceptionally nice to work with and even conveyed to me some of the building's history and intended future. Restored to original condition in the summer of 2010, the original building front had been covered by a brown facade, which was added in the 1960's for a more modern look. As the neighborhood lost businesses the new front was boarded up and the building left unused. 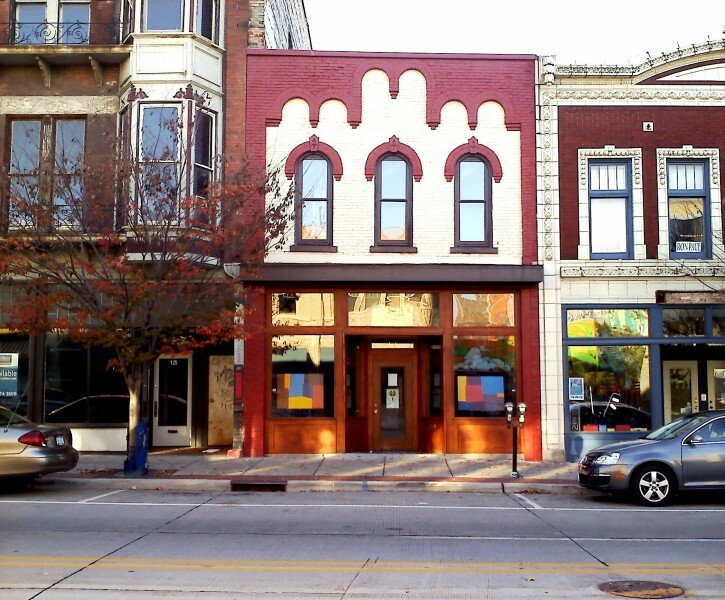 He and his wife bought the building in 1990 and used the loft apartment on the upper floors as a living space for themselves and for their children when they were attending college. 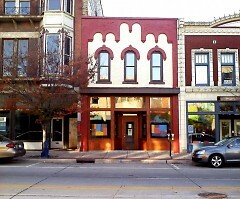 The building has been restored with its original wood floors, tin ceiling, and loft apartment. They plan to open an art gallery on the Division level and artist workshop on the Commerce level. The gallery is planned to open in the summer of 2013. The window exhibition"Urban Abstraction" can be viewed during the second night of Free Radical (see info above on the right) and will also be on display beyond the event for daytime and evening, casual or intentional viewing.